The present state of technology of an ultrasonic pulse echo method to study the structural geometry of concrete members is discussed. Separate transmitting and receiving transducers are used and the reflected signals are recorded by a synthetic aperture focusing technique. The reflected and scattered waves in the test specimen are analysed by means of specific reconstruction algorithms. A laser vibrometer is used as the ultrasonic sensor to be able to record and process a huge number of records. The application of this method for measuring the thickness of concrete and for analysing tendon ducts is discussed. In particular the pulse echo methods1 offer a potential technique to examine large areas of building elements non-destructively from one surface. A very short electromagnetic (radar) pulse, an ultrasonic or mechanical pulse (impact) is created at the surface and its reflection and its backscatter from the internal structure of the element is analysed. Although in 1991 the first attempts to use ultrasonic pulse echo methods for non destructive tests of concrete structures were still considered to be unpromising (1), enormous progress has in the meantime been achieved. An ultrasonic pulse echo method will below be described which has in recent years been developed in BAM for testing concrete members. The principle is that separate transmitting and receiving transducers are used with a two-dimensional synthetic aperture. The initial tests were performed by Wüstenberg (2). The principle is outlined in section 2, its application for thickness measurements of concrete members in section 3, and the application of the laser vibrometer as the ultrasonic sensor and the two-dimensional reconstruction of the backscattered waves from the specimen are described in section 4. 1 Methods: The term pulse echo is used here in its general meaning and does not relate to the specific meaning in ultrasonics. The transducers which are generally used for ultrasonic testing generally create a defined type of wave which propagates in a defined direction. 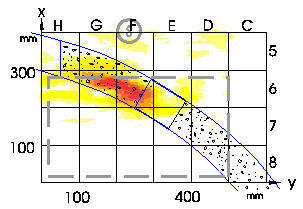 Inhomogeneities in the material to be investigated are located by determining the travel time of the reflected US pulse. Scanning probes or arrays of probes are employed to provide images of the inhomogeneities. Such a procedure cannot simply be applied for examining concrete as due to the concrete aggregates wavelengths of ca. 13 to 100 mm (f = 300 to 40 kHz) have to be employed. As it is impossible to develop transmitters producing a defined wavelength and direction in this range, the ultrasonic signals received are made up of the backscatter of longitudinal, transverse and surface waves which are reflected from different areas and the surface of the test specimen (3). When different ultrasonic signals which are recorded one after the other are combined, this is called a synthetic aperture. This principle is applied here in such a way that first the ultrasonic intensity related to time (A scan) is measured and recorded at different positions of the transmitting and receiving transducers. The A scans are time shifted and superimposed, so that the reflection and backscatter from the area of interest are amplified; the disturbing or interfering signals are partly suppressed because of their stochastic phase relation. The ratio of useful signals to disturbing signals is thus improved according to the laws of statistics. The velocity of the longitudinal waves and their homogeneity in the area to be investigated must, however, be known (3, 4). With regard to transducers a lot of research has been done in the recent years and their properties have considerably been improved. Wideband low-frequency transducers are now commercially available which cover a frequency range of 50 to 300 kHz and which generate short pulses of about 50 µs. For the tests described below the transmit pulse is as short as possible, thus having a broad frequency spectrum. As errors occur when the travel time of signals is measured between the pulse edges which is usually done by commercial ultrasonic devices because the signals are attenuated (5), the travel time in the below described experiments is in general measured from the maximum of the transmitted pulse to the maximum of the received echo. Below two examples will be presented for the thickness measurement of concrete members. The depth resolution is essentially improved when the ultrasonic energy instead of the ultrasonic intensity is considered, i.e. from the expected arrival of the pulse during the pulse width (integration method) (6). As the shape of the ultrasonic pulses is influenced by the concrete thickness through which the pulses travel and as the results depend on the integration interval, a correct integration depth must be determined for each measurement. Figure 1: Measurement of a concrete specimen (0.50 m thick) with a maximum aggregate size of 32 mm. Left: travel-time corrected superposition of 100 A-scans (distance between transmitting and receiving transducers 50 to 700 mm). t 0 : expected travel time of the echo signal. Right: pulse energy vs calculated thickness for the integration interval which is indicated at the left side. The resolution for the thickness measurements is 30 mm. The thickness of concrete members with a maximum aggregate size of 32 mm can be determined with the help of this new technology which was not possible before. Figure 1 shows measurement results of 500 mm thick concrete specimens obtained from 100 A-scans. The distance between transmitting and receiving transducers was varied between 150 and 300 mm. Figure 2: Examination of the foundation slab of a sluice head by means of time-corrected superposition. The maximum pulse energy measured at 0.65 m was produced by a construction joint. The thickness of the foundation slab near the measured area was 1.35 m.
Another interesting challenge was the examination of a submerged foundation slab of compressed concrete below a sluice head. The transducers were positioned by a diver and the signals were transmitted via a 10 m long cable. Figure 2 shows a construction joint located in the foundation slab. Due to this construction joint the thickness of the foundation slab could not be determined, but the intensity of the reflected signals reveals a poor concrete quality in this area, a fact which was afterwards verified by taking cores. This example demonstrates clearly the advantages of non-destructive testing: Large-area scanning discloses potential internal defects. A few cores taken from some areas will then give a clear picture of the condition of the examined area. This NDT method requires much fewer cores for surveying a complete structure than conventional destructive tests. Reconstruction algorithms are applied for the identification of unfilled voids in tendon ducts. They focus the data measured on an aperture to every point of the reconstructed area through superposition of the time records. These algorithms are known as SAFT (Synthetic Aperture Focusing Technique) and have for some time been successfully used in non-destructive testing of metals and plastics with linear apertures (LSAFT). They are now being developed for three- dimensional reconstructions (3D-SAFT) (7, 8). Voids in tendon ducts lead to a maximum change of the acoustic impedance. But the propagation of sound waves in reinforced concrete is also influenced by reinforcing bars and the tendon ducts themselves, although to a lesser degree (9). Below first results of the 3D-SAFT reconstruction method for concrete specimens with artificial voids in tendon ducts are presented. Huge numbers of data are required for a meaningful application of the reconstruction algorithms and the positions of the transmitting and receiving transducers on the surface must be exactly determined. As it is very difficult to establish a reproducible contact between the transducers and the concrete surface, the coupling agents used for examining metals cannot be applied. Instead a laser vibrometer was used, i.e. a scanning laser interference vibrometer (Polytec OFV 300). The laser spot is positioned on the surface by a mirror scanner and at each point the vibration is measured. The laser vibrometer registers vibrations in the range of 0.1 to 1 MHz in the direction of the laser beam. In order to suppress the influence of disturbing vibrations, a band pass filter is used to narrow the frequency range. The data are recorded by an oscilloscope which permits a time averaging to optimize the signal to noise ratio. For measurements in concrete the surface is usually coated with a autoreflective coating. In order to be able to examine large surfaces rapidly, the time averaging process must be optimized. This means that the alternatives, i.e. improvement of the signal to noise ratio by time averaging and rapidity of the measurements have to be weighed up carefully. This will be explained by the following example. A concrete specimen with a partly unfilled tendon duct 315 mm below the surface was examined. The reflections from the back wall were recorded at 250 µs and those of the tendon duct at 160 µs. The surface was 200 * 300 mm2 at a scanning spacing of 10 mm. Figure 3 shows the travel-time-shifted superposition of two series which differed only by their mean values (400 and 20 mean values for each measurement point). As could be expected the signal to noise ratio was not so good in the second series and the results of the superposition were less significant, but the data could still be evaluated (10). The measurement time was reduced from 3.5 h to about 10 minutes. Figure 3: Scanning laser vibrometer used as an ultrasonic transducer for locating a tendon duct in a concrete specimen with a maximum aggregate size of 8 mm. Synthetic aperture: 300*200 mm2 , spacing 10 mm. Thickness measurement was performed by applying a special algorithm. The tendon duct can be identified at a depth of 350 mm (160 µs) and the back wall echo at (500 mm at 250 µs). Time averaging at each point: 400 (above); 10 (below). Although the signal to noise ratio with 10 averages for each measurement point is definitely less favourable, the set of data can still be used for threedimensional SAFT imaging. The time required for recording the data can thus substantially be reduced. The location of unfilled areas in tendon ducts is described below. A specimen with a metal tendon duct was examined which contained artificial voids. The duct was asymmetrically placed in the 500-mm-thick specimen. The concrete cover at face A was 100 mm and at face B 330 mm. The strength category of the concrete was B45 and the maximum aggregate size 8 mm. Figure 4: Evaluation of a set of data of 975 A-scans of a test specimen with a tendon duct (concrete cover 315 mm, specimen thickness 500 mm) containing a void. Transmitter (S) (centre frequency 80 kHz), aperture of the scanning laser vibrometer, dotted area, right. Left: time-averaged evaluation, the tendon duct and the wall thickness are clearly visible. Right: 3D-SAFT reconstruction, section at 350 mm. The reconstructed scattering maximum correlates with the position of the void as it was determined by g-radiography. The data were recorded with a laser vibrometer with a fixed transmitter and were reconstructed by means of 3D-SAFT algorithms applied to the measured data sets at the Fraunhofer IZFP in Saarbrücken. g-radiography was used to verify the results (11). The aperture which was used for the experiments shown in figure 4 was 400*300 mm2with a scanning spacing of 10 mm. The travel-time-shifted superposition (left) show the back wall echo and the reflections from the tendon duct. The results of the three-dimensional reconstruction (right) demonstrate that the maximum backscatter correlates well with the vertical and horizontal position of the void. The shrinking cement in the tendon duct may cause spallings which cannot be distinguished by ultrasonic measurements from macroscopic voids when they extend over larger areas. At the interfaces between concrete, tendon and cement, the ultrasonic waves are so strongly reflected that their reflection intensity exceeds that of the voids when the travel paths are relatively small (9). Figure 5: Concrete specimen (same as shown in fig. 4): Comparison of 3D-SAFT reconstruction to the position of an artificial void in a tendon verified by means of g-radiography. Section through the reconstruction 330 mm below the surface. Dotted area represents the synthetic aperture and the position of the transmitter. At this position of the transmitter the tendon duct cannot be located. The reasons are probably spallings of the cement from the tendon duct. of the transversal to longitudinal scattering of the acoustic waves is measured, i.e. the waves leaving the transmitter as longitudinal waves and reaching the receiver as transverse waves, the tendon duct may correctly be located. The detectability of unknown objects or defects inside concrete is more difficult, however, as the data obtained by multiple wave transformations and multiple echoes may be uninterpretable. The above outlined technique requires further development and improvement, especially with regard to a numerical modelling of elastic wave propagation using specified elastic constants and marginal conditions, as is for example available with the Elastodynamic Finite Integration Technique (EFIT) (12). The ultrasonic pulse echo technique with a synthetic aperture and separate transmitting and receiving transducers can be used to measure the thickness of concrete with a maximum aggregate size of up to 32 mm. This is particularly helpful when submerged structural elements are to be examined, i.e. in situations where it is avoided to take cores. 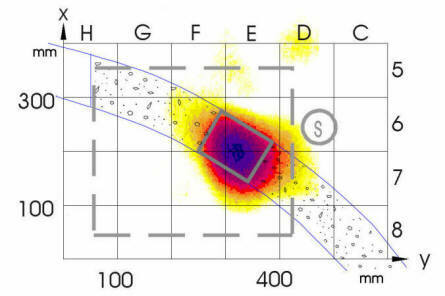 An example has been presented where voids in tendon ducts could efficiently be identified when a scanning laser vibrometer was applied as an ultrasonic sensor. A 3D-SAFT reconstruction algorithm was used for imaging the measured data. The first practical application of this technique for testing a reinforced concrete bridge is being prepared. The technique presented here requires a relatively sophisticated equipment and the measurements are quite time-consuming. For the tasks outlined above other methods using acoustical waves (impact echo, other modifications of the ultrasonic technique) are also available. Moreover, the radar method can be used. Although the radar technique cannot be used for identifying the interior of metal tendon ducts, it offers advantages in so far as large surfaces can rapidly be scanned. When the results of tests using different techniques are evaluated, it can generally not be decided whether a certain technique would have been more or less suitable in a particular case as the test conditions usually vary greatly. In order to promote the application of non-destructive test methods for civil engineering, it is, however, important to be able to choose the most suitable method for each particular situation. For this reason, the BAM initiated cooperative laboratory tests with the aim to compare different ultrasonic techniques, e.g. impact echo and radar, both quantitatively and qualitatively (13). The Federal Highway Research Institute (BASt) will support the continuation of these tests. The new test series focuses on how efficient these methods are to identify reinforcement bars in concrete members with a maximum aggregate size of 16 mm. The three-dimensional reconstruction algorithms (3D-SAFT) were carried out at the Fraunhofer IZFP in Saarbrücken (Dr. V. Schmitz, W. Müller). The software of the scanning laser vibrometer was developed by Dipl.-Phys. G. Wilsch and Mrs. S. Thiele. Some graphs were processed by Dipl.-Ing. D. Schaurich. The Paper was first published in the Conference Proceedings of The British Institute of Non-Destructive Testing International Conference "NDT in Civil Engineering", 8-11 April 1997, The University of Liverpool, UK, published by The British Institute of Non-Destructive Testing, ISBN 0 903132 23 0, Volumes 1 and 2.